In a forum, someone posted that they felt they were coming under some extra scrutiny at their workplace since they started dialysis. They asked if they should be concerned about that. They could be covering their butts or it could also be genuine concern. As an employer they are required by law to “reasonably accommodate” people with disabilities under the Americans with Disabilities Act. If they act in a manner that doesn’t take your dialysis into account, they could be sued by the EEOC. Who is asking the questions? The Human Resources people, your supervisors, co-workers? If it’s HR, they could be trying to make sure you are “reasonably accommodated”. If it’s your supervisor, he/she should be acting on behalf of the HR dept. If it’s co-workers, they could be curious. Since you raise the issue and are concerned about it, I would talk to the HR manager and ask what their concerns might be. MAKE SURE YOU DOCUMENT EVERYTHING about that meeting including when, where, what was said, etc. Take those documents home. Don’t leave them at work. Very simply, you could be under scrutiny and don’t think they might not be watch you. You could be showing up on the Insurance Company’s radar as a very expensive beneficiary and the company could be asking questions and seeking answers. Don’t think they are your friend. To them, you are a burden and they’d like to get rid of you as soon as possible. If I sound skeptical, it’s because I didn’t read the signs myself and I’m in an EEOC suit with my former employer right now. I hope it’s just genuine concern. You should be able to get an idea by talking with HR if the questions are coming from above you. In my case, I didn’t see it coming and I was “laid off”. It clearly had to do with my dialysis and disability and nothing to do with my job performance. (For the posting about that see here.) Because I didn’t see the signs, it was a shocking event and came at a time when I was least prepared. I didn’t have all the documentation I could have because some was still on my office computer that fateful morning. 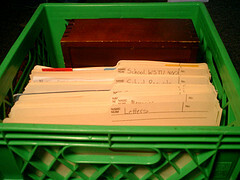 But I did have the foresight to accumulate most of what I needed in a Personal File in my desk. When I was struck by the lightning quick, “pack up your things” order, that file was the first thing I grabbed. It contained all my performance reviews and correspondence with HR and my supervisors about my medical disabilities. Whenever I wrote to HR or my supervisor, I printed out a copy of the emails and placed them in that file. If I hadn’t put it all together in one place, I probably wouldn’t have had time to gather it all together. So, in my advice to others, I remind them to keep everything in one place and in paper form not just on your office computer. I hope no one has to endure what I’ve had to put up with. Suddenly being terminated is not fun and add on the fact that I have significant medical issues and it’s much worse. But there are things you can do to make it less bumpy. I hope I can pass along what I’ve learned so others don’t have to go through what I am going through. This entry was posted in ADA, ADEA, disability, discrimination, personal and tagged ADA, ADEA, Americans with Disabilities Act, dialysis, EEOC, employment, ESRD. Bookmark the permalink.